Claims to be world's thinnest tablet yet. CES 2012 will kickstart soon, and we can expect a few tablets to launch at the event. 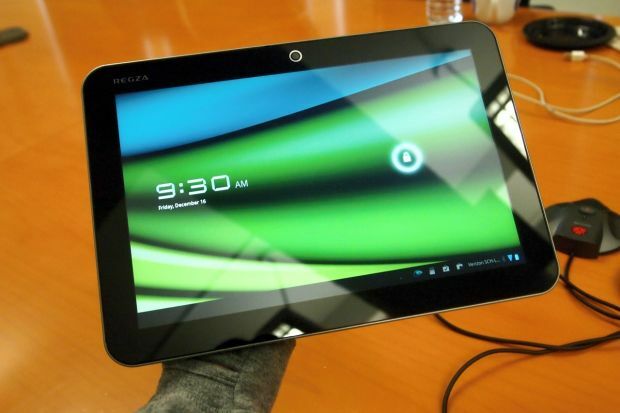 Toshiba will be launching the Excite X10, which is said to be the thinnest 10" tablet to date. The 7.6 mm slate will feature a brushed magnesium alloy finish back panel and a Corning Gorilla Glass display with pixel dimensions of 1280x800. Powered by a TI OMAP 4420 1.2 GHz dual-core processor and 1 GB of RAM, the OS details are a bit sketchy as of now. The tablet will be ready by March and will either run on Android 3.2 (Honeycomb) or 4.0 (Ice Cream Sandwich). The device will also feature a 2 mp front-facing camera for video calls and a 5 mp camera at the back. The X10 will come with micro-USB, mini-HDMI, and microSD card ports. It will be named as Regza for the Asian markets. Pricing details have yet to be disclosed.